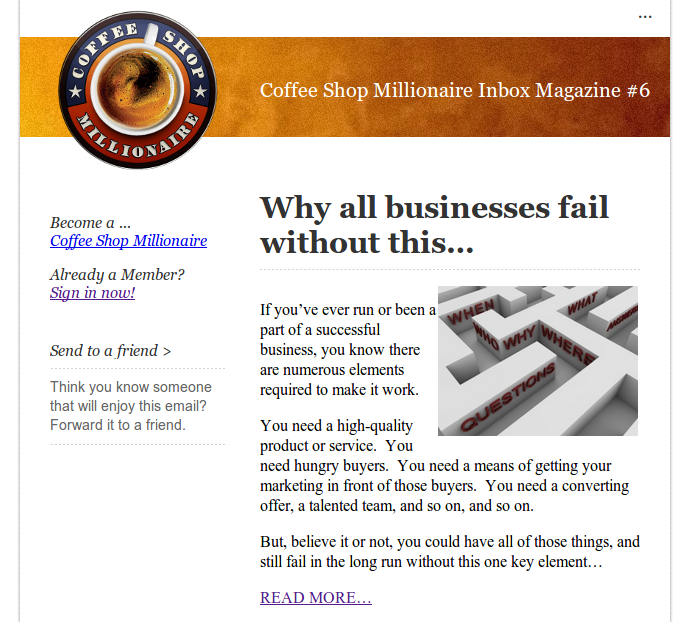 The Coffeeshop Millionaire shouldn't be about affiliate offers and making money - it's about giving real value. People want to learn how to earn extra income online - not just keep hearing about how to spend it. Two out of the three are something you can buy. All the headlines make it seem like there's an interesting story there - but after the fluff, someone is wanting you to buy something. You got to wonder why I'm still subscribed after all this time. 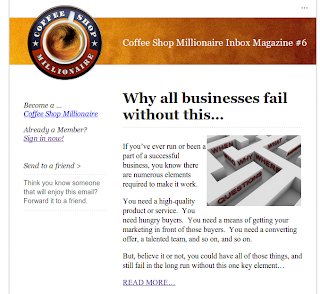 Well, at it's basic, the Coffee Shop Millionaire does give a decent overview of how to succeed, particularly if you just want to find out how these fast-buck affiliate offers wind up in your inbox - and how they expect to profit from your opt-in. What should be happening is some great advice about what you can do - tips and tricks - which will open up additional services or products you can in turn help other people to apply. The real secret to getting rich is right down the lines of The Golden Rule: you have to help other people succeed in order to enable them to help your success. Your point as usual is to "Let the Buyer Beware." Check out the popular posts on the right and decide for yourself. Certainly, CSM is a cheap enough entry. But realize also that you've just added more traffic to your inbox. Want to make real online millions? Check out T. Harv Eker's Millionaire Mind Intensive. He gives real value and the emails from him are devoted to ensuring you have the tools to improve your life.